What is Radiofrequency? Lumbar & cervical radiofrequency ablation procedure.Radiofrequency waves are electromagnetic waves which travel at the speed of light, or 186,000 miles per second (300,000 km/s). Radiofrequency Energy is a type of heat energy that is created by a special generator at very high or super high frequencies. With the use of this specialized generator, heat energy is created and delivered with precision to target nerves that carry pain impulses. The resulting “lesion”involves a spherical area of tissue destruction at the tip of the RF needle that can include pain-carrying nerves. Why is this procedure done? Radiofrequency ablation/lesioning is a procedure used to provide longer term pain relief than that provided by simple injections or nerve blocks. Many patients who are being considered for this procedure have already undergone simple injection techniques like Epidural Steroid Injection, Facet Joint Injection, Sympathetic Nerve Blocks, or other nerve blocks with pain relief that is less prolonged than desired. By selectively destroying nerves that carry pain impulses, the painful structure can be effectively denervated and the pain reduced or eliminated for anywhere from a few months to up to 12 months. How is this procedure done? Once a structure has been determined to be a pain generator, its nerve supply is targeted for interruption. A small insulated needle or RF cannula is positioned next to these nerves with fluoroscopic guidance (live video X-Ray). Your doctor knows where to place the RF cannula because he is an expert in anatomy. The shaft of this cannula except for the last 5 to 10 mm is covered with a protective insulation so that the electric current only passes into the surrounding tissues from the very tip of the cannula. When the cannula appears to be in good position, the doctor may perform a test and release a small amount of electric current through the needle tip at two different frequencies. This test helps to confirm that the cannula tip is in close proximity to the target nerve and that it is not near any other nerve. After a successful test confirms good cannula tip position, a local anesthetic is injected to numb the area. 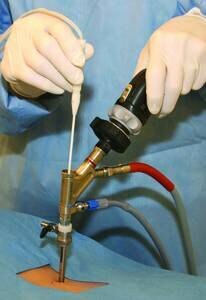 The RF generator is then used to heat the cannula tip for up to 90 seconds, and thus the target nerve is destroyed. What types of conditions will respond to Radiofrequency Lesioning?Radiofrequency treatments for chronic pain. There are a multitude of chronic pain conditions that respond well to this treatment. Chronic spinal pain, including spinal arthritis (spondylosis), post-traumatic pain (whiplash), pain after spine surgery, and other spinal pain conditions are those most commonly treated with RFL. Other conditions that are known to respond well to RFL include some neuropathic pain conditions like Complex Regional Pain Syndrome (CRPS or RSD), peripheral nerve entrapment syndromes, and other assorted chronic pain conditions. A patient’s candidacy for RFL is usually determined by the performance of a Diagnostic Nerve Block. This procedure will help to confirm whether a patient’s pain improves just for the duration of the local anesthetic (or not). Patients who have little to no pain relief after a diagnostic nerve block are not candidates for a neurodestructive procedure like RF Lesioning. Does the procedure hurt? This procedure is no more painful than any other injection procedure that is performed in interventional pain management. Patients are often given mild intravenous sedation during the procedure, but sedation is not absolutely required. Deep sedation is not a safe alternative and is therefore not offered for my RF procedures. It is quite common for neck or back pain to increase for a few days or longer after the RFL procedure before it starts to improve. What should I do to prepare for my procedure? On the day of your injection, you should not have anything to eat or drink for at least eight (8) hours before your scheduled procedure. If you are scheduled to receive sedation during the procedure, you must have someone available to drive you home. If you usually take medication for high blood pressure or any kind of heart condition, it is very important that you take this medication at the usual time with a sip of water before your procedure. If you are taking any type of medication that can thin the blood and cause excessive bleeding, you should discuss with your doctors whether to discontinue this medication prior to the procedure. These anticoagulant meds are usually prescribed to protect a patient against stroke, heart attack, or other vascular occlusion event. Therefore the decision to discontinue one of these medications is not made by the pain management physician but rather by the primary care or specialty physician (cardiologist) who prescribes and manages that medication. Examples of medications that could promote surgical bleeding include Coumadin, Plavix, Aggrenox, Pletal, Ticlid, and Lovenox. What should I do after my procedure? Discharge suggestions following procedures, Dallas Texas. Following discharge home, you should plan on simple rest and relaxation. If you have pain at the needle puncture sites, application of an ice pack to this area should be helpful. If you receive intravenous sedation, you should not drive a car until the next day. Patients are generally advised to go home and not return to work after this type of procedure. Some patients do return to work the next day. Could there be side effects or complications? Dr. Khatri will discuss these issues with you, and you will be asked to carefully read and sign a consent form before any procedure is performed. Can this procedure be repeated if my pain returns? It is possible for the treated nerve(s) to regenerate, which could lead to recurrent pain. However, RF Lesioning is repeatable for nerve regeneration if it worked the first time around.